The greatest fusion reactor in our neighborhood sends energy free for the harvesting from about 8 light-minutes away, where it safely burns and flares without any help at all from the small, blue marble that orbits it once a year. But expansion of photovoltaic technologies to capture that solar power has had a hard time competing against the big boys of power: petroleum, coal, and nuclear reactors. It's no wonder scientists and engineers continue to pursue the dream of harnessing nuclear fusion here on Earth. A "small, modular, efficient fusion plant" designed by a team at MIT promises new hope for growth in the fusion industry. Equipment of similar scale and complexity has been constructed in "within about five years" the team notes. The MIT affordable, robust, compact (ARC) reactor uses the same tokamak (donut-shaped) architecture as the ITER plant, but applies much stronger magnets based on commercially available, rare-earth barium copper oxide (REBCO) superconductors. The stronger magnetic field contains the super-hot plasma, a mass of gases in which hydrogen atoms fuse to form helium (yes, the party balloon gas that gives you a squeaky voice), in a much smaller device. This reduces the diameter to half of ITER's, making building it quicker and more economical. But the size advantage is not the only bonus. The power potential in fusion reactors increases by the fourth power of the increase in the magnetic field. This means doubling the magnetic field strength can produce16 times as much power. The MIT ARC reactor has other benefits as well: the fusion power core can be removed from the donut-shaped reactor without having to dismantle the entire device (useful for testing materials) and a liquid replaces most of the solid blanketing the fusion chamber, allowing circulation to reduce degradation in the high temperature application and facilitating replacement which reduces the cost of maintenance. 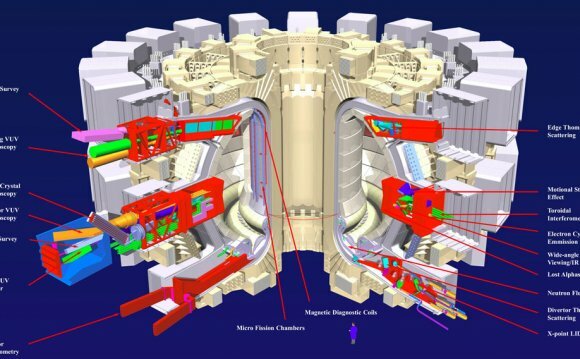 Read more about it in ARC: A compact, high-field, fusion nuclear science facility and demonstration power plant with demountable magnets in the journal Fusion Engineering and Design.